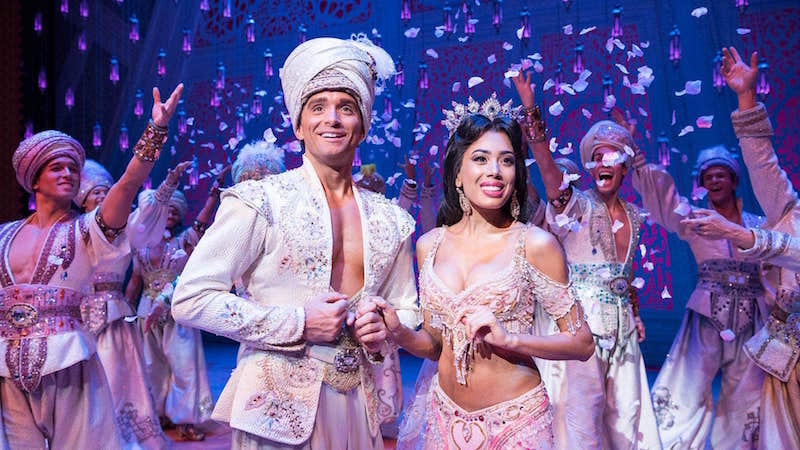 Guest reviewer Andrew Parker reviews Aladdin for Musical Theatre Musings. 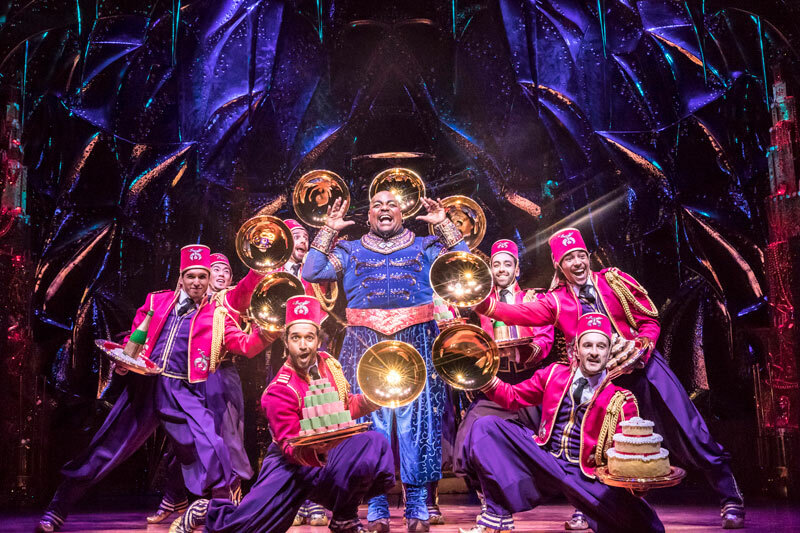 Aladdin is originally a character from an 18th century folk tale but for most people until 1992 the mention of the name made people think of panto at Christmas. That all changed very quickly when Disney decided to add a variation of the story into its list of animated films, yes it really was 26 years ago!! Fast forward nearly twenty years from the film release and after several small adaptations of some of their titles and with “Lion King” going strong Disney’s theatrical arm decided to bring to life on stage the magical story of this cheeky little street rat. The current stage production uses a combination of well known songs from the original film alongside three songs written originally for the film but never used and four brand new songs written especially for the stage production. 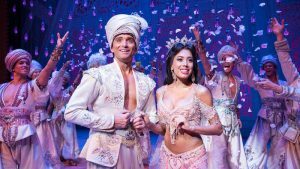 Disney’s ability to create and make magic happen is put to the fore in this production. You sit down in the auditorium expecting to be “wowed” and you are, eventually! The show, opened with a prologue by the genie, starts well and you are soon rewarded with a brightly coloured well designed busy marketplace with the well known up tempo “One Jump Ahead.” Unfortunately the high energy start soon fades out to build up the meeting and development of the love story side, only broken by one of the new/unknown songs performed by Aladdin and his “gang”. 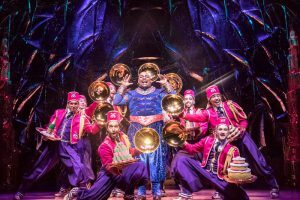 The show does blast back into life in the cave of wonders with the (re)arrival of the Genie. Visually the show is about as close to faultless as it can possibly be and Disney’s designers clearly had some help from a little of Tinkerbell’s fairy dust. I dare not even take a guess at how many hundred thousand rhinestone crystals have been used by the costume department to make the outfits sparkle in line with every other aspect of the show. The set that moves around the stage almost as much as the cast is complimented by projection and scenery to seamlessly move the story along between various locations. Two stand out scenes visually were the cave of wonders, which I won’t spoil for anybody planning on going to watch the show, and the expected magic carpet ride for “A Whole New World.” During the latter the loved up couple do take off and fly, but not across the stage as with some technical wizardry the entire stage and pros arch disappear into the star filled sky. The stage was almost constantly busy with performers, with the odd exception. The show is so well choreographed that every move added to the show and was never a distraction from anything else happening at the time. As you would expect with the names Disney and Cameron Mackintosh putting together a world class cast from across the globe doesn’t seem to have been an issue with every person on the stage showing clearly that they deserve to be there. It does need to be said that, much like Robin Williams did in the film, the Genie, played brilliantly by Trevor Dion Nicholas, does steal the entire show with his performance of “Friend Like Me”. Not only was he outstanding with his singing and movement but the humour and comic timing of the character made him even more lovable and bringing plenty of laughs. I would advise you stick to the recommended minimum age of 6 years old but other than that if you love Disney, love musicals or even just loved to be entertained live then this show is definitely worth watching. To find out more about the show and to book tickets visit their website. If you like this review you might also like my review of School of Rock, Matilda and Strictly Ballroom.